Cook dal with 3/4 cups of water, let it cool and mash well. Make syrup of jaggery, by boiling it with 3/4 cup of water. Slice 2-3 thin long pieces from coconut keep aside. Grate the rest of coconut. Take the milk by squeezing well (first extraction of milk), keep aside. Grind the remaining coconut in a mixer for 10-20 seconds. Mix well with 1 cup of water and take the second extraction of milk. Similarly take third extraction of milk. In flat, thick-bottomed pan heat 1 tbsp ghee and add mashed dal. Mix well and fry for a while till ghee separates. Add jaggery to pan, mix well and keep stirring till it comes to a boil. Add the third extraction of milk, keep on stirring. Bring to a boil then reduce the heat to low medium and cook continuously stirring till coconut milk reduces by half. Now add second extraction of milk and repeat the same process. Add first extraction of milk. If required add little sugar. And switch off the stove and let it remain there for 30 minutes. Meanwhile cut the coconut strips into small pieces. Heat remaining ghee in a pan and fry the coconut pieces till brown. Pour over the hot pradaman. Serve hot or refrigerate and serve. 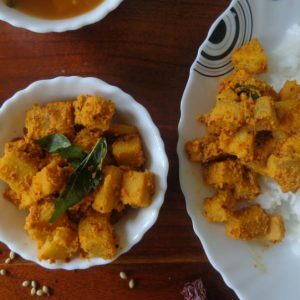 Feel free to comment or share your thoughts on this Parippu Pradhaman Recipe from Awesome Cuisine.